Since George Szell recorded both these works in Cleveland with his own orchestra, one wonders how useful it is to rake up these live versions. Should BBC Legends not be concentrating on unrecorded repertoire, or works from the regular repertoire which the artists in question did not record commercially? However, the NPO performance is a much tougher affair, working up to a savage intensity in the first movement development (and with the same strange cut-back of the upper strings in the recapitulation to bring out the theme on the cellos). This is thrilling. The second movement is not exactly humorous but has a certain fierce zest. Doubts began to arise with the third movement where the majestic conception is somewhat undermined by the insistence with which the accents are hammered out, and, while one doesn�t exactly expect a Viennese lilt from Szell, might he not have found a little more relaxation in the trio? My doubts crystallized in the finale. No one could accuse Szell of underplaying the great moment near the end, where the trumpets and drums enter, wrenching the music back to the home key from the far-flung tonality in which it had arrived; he seemingly takes the players by the scruff of the neck and smashes their heads into the ground. But long before this I had begun to reflect that if for Toscanini music was essentially melody, for Szell it is essentially accents, deadly karate-chops every one of them. It is overbearing, brutal and ultimately self-defeating, and a closer recording than usual with these BBC offerings emphasises the point. Turn to the Cleveland version and, with an orchestra Szell could by now play on as if it were his own hand, he is far more relaxed, with the accents well placed but not blown out of proportion and a certain Mozartian grace and delicacy of pointing and an air of bonhomie which gives the tougher moments all the more impact when they come. Tension is in one sense lower, but the performance is far more wide-ranging and complete. And better recorded. So, while the BBC disc is not useless, in the sense that it adds to our knowledge of the conductor, it is to the Cleveland recording that we must turn for a version that still ranks high in the catalogue. The Ninth can better withstand being manhandled, but I sense that Szell is gradually relaxing, trusting his players more. By the recapitulation in the first movement the tension is fairly seething, and this time the sounds seems to be released from the orchestra rather than beaten into it. Much of the finale truly catches fire with a mobile yet deeply felt interpretation of the slower central part. At the section marked "Adagio ma non troppo, ma divoto" he achieves a hushed reverence which his slow movement, though expressive and generously sung in the 3/4 sections, just missed, while the closing stages are terrific. The New Philharmonia Chorus give him their all and the solo quartet is better balanced than many. The performance is also notable for a fiercely driven Scherzo. Purists are warned that Szell, like many of his generation, tinkered with Beethoven�s orchestration here and there. The recording is one of the best in this series. This, then, is a Ninth that I am glad to have and the set provides interesting evidence that Szell screwed up the tension considerably more live than in the studio. All the same, he was a perfectionist and in many ways studio conditions enabled him to achieve the perfection he sought without (usually) lapsing into pedantry. I daresay he would have been caustic about the issue of these performances as an alternative to those he had officially passed for release. 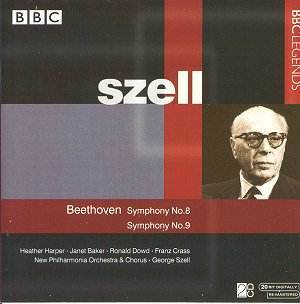 On the whole I feel BBC Legends would be providing a more useful service to music lovers by seeking out material which Szell did not record in the studio; conversely, if the BBC archives contain recordings of the Ninth by either Barbirolli or Boult, I should love to hear them.